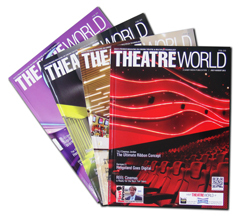 TheatreWorld is a guide to the cinema exhibition industry and technical design of a movie theatre published by Network208. TheatreWorld is top-of-the-mind recall for the global cinema exhibition industry, is a quarterly B2B media entity, which facilitates domestic and international business exchanges, and acts as a gateway to international manufacturers targeting the Asian Market. Cinema builders / operators, Architects, Interior Designers, Acousticians, AV Professionals, Project Management Consultants, equipment manufacturers, vendors/dealers, channel partners, and just about anybody connected with driving the global cinema exhibition industry, takes TheatreWorld as a handbook. It’s been Network208’s endeavour to reach out the readers with more variety in structure and texture- the two essential ingredients of cinema exhibition industry, the company’s carefully chosen domain! TheatreWorld is thus an entertaining yet informative mix of international and national industry updates, brought in two exclusive sections – TheatreWorld for international and TheatreMagic for India.